Does an apple that turns brown, turn you off? Nah, it’s just a natural process, right? Well, not anymore. In a quest to perfect the humble apple, scientists have created a genetically modified apple that won’t brown when sliced. It’s called the Arctic apple. Supporters of GM food say the Arctic apple provides an alternative to pesticides, benefits health and can even cure worldwide hunger. Critics, on the other hand, say the apple is understudied, unlabeled and unnecessary — no matter how you slice it. What’s inside the Arctic apple? Heaps of controversy follow genetically modified foods. But, controversy aside, non-browning apples are supposedly more appealing and convenient, according to Okanagan Specialty Fruits Inc., developer and manufacturer of the Arctic apple. However, before GM supporters hail this as a victory for the food industry, let’s look inside this apple and see if it’s actually something consumers want to sink their teeth into. All organic foods will turn brown, including apples when they are cut or bruised, thanks to the protein enzyme polyphenol oxidase, or PPO. The same type of “oxidative” browning even occurs in the browning of tea and coffee. So, what about an apple that doesn’t turn brown, could you tell if it was rotten or past it’s prime? The short answer is no, says NPR.org. Within five minutes of slicing, browning may alter the taste of your apple and may not be so aesthetically pleasing, but it doesn’t mean the apple is rotten. Nevertheless, to create a more aesthetically pleasing apple, the GM apples developed by Ok Specialty Fruits stop PPO production with a man-made gene containing pieces of four natural PPO genes. This signals an automatic red flag for the apple cell — like it’s being attacked virally. So, it slices and dices up every sequence of DNA that looks suspicious, keeping the apple flesh light. “The beauty of this [process] is it’s a natural plant defense mechanism,” says Neal Carter, Okanagan’s president. Even when sliced, these apples won’t brown for about two weeks. That’s approximately the same extended lifespan as apple slices from fast-food chains like McDonald’s and Burger King, which use lemon juice and calcium ascorbate to prevent browning. “Ultimately, we just want people to eat more apples,” says Carter. He also argues the creation of Arctic apples would help apple slice producers, who can lose up to half of their product from browning during production. Consumers worry: are these apples safe to eat? Even though the first GMO apple was approved by the U.S. Department of Agriculture in 2015, GMO critics hope consumers will continue to be skeptical about the produce. “This apple is understudied, unlabeled and unnecessary,” according to Dana Perls, the senior food and technology campaigner with environmental nonprofit Friends of the Earth. In the meantime, Intrexon, a leader in the next generation of GMOs, is pushing to release another variety of GMO apple, engineered to stop the browning process when sliced or bruised. Browning in apples can be prevented naturally, after all, by simply applying lemon juice to the flesh. So, why take unnecessary risks for purely aesthetic reasons, says Friends of the Earth. The U.S. Apple Association, which represents the American apple industry, opposes introduction of the non-browning apple, as do other industry organizations, according to the New York Times. 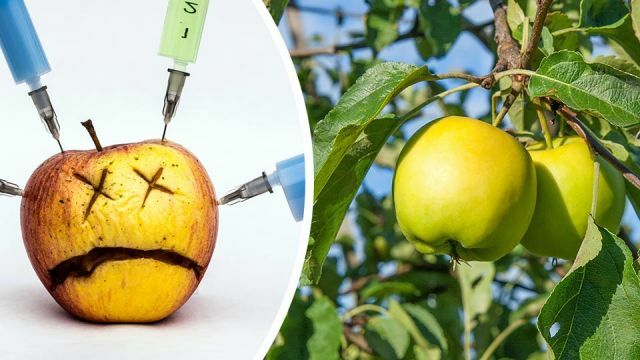 Although they do not believe that the genetic engineering is dangerous, they think it could undermine the apple’s image as being healthy and natural. Apple farmers are also worried since GMO apples could cause valuable export markets to reject U.S. apples, which has happened with other GMO crops in the past. More than one-third of U.S. farmers’ apple revenue comes from exports. The Northwest Horticultural Council also oppose the GM apple. The council, which represents Washington apple growers, grows more than 60 percent of all apples and more than 80 percent of organic apples in the U.S.
Will these apples improve food waste? Americans throw away almost as much food as they eat because of a “cult of perfection,” reports Suzanne Goldenberg, U.S. environment correspondent for The Guardian. And with that comes more hunger and poverty, while also inflicting a heavy toll on the environment. In fact, tons of fresh produce grown in the U.S. is left in the field to rot or hauled directly from the field to landfill. This is what ultimately makes GM fruits and veggies so appealing for manufacturers, distributors and even consumers, which is why you’ll likely see more GMO fruits and vegetables approved in the future. The bottom line is this: grocery stores are already packed with genetically modified foods. Unless you know which products are genetically modified, in the hopes of avoiding them, there’s a good chance GMO food are already a part of your diet. That said, is the “pre-sliced” Arctic apple something you feel good about eating and feeding your family? Hey Buddy!, I found this information for you: "These Genetically Modified Arctic Apples Don’t Turn Brown". Here is the website link: https://www.thealternativedaily.com/these-genetically-modified-arctic-apples-dont-turn-brown/. Thank you.